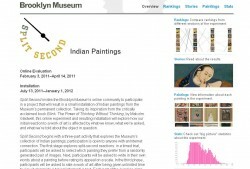 Split Second invited the Brooklyn Museum's online community to participate in a project that resulted in an installation of Indian paintings from the Museum's permanent collection. Taking its inspiration from the critically acclaimed book Blink: The Power of Thinking Without Thinking, by Malcolm Gladwell, the online experiment and resulting installation explored how our initial reaction to a work of art is affected by what we know, what we're asked, and what we're told about the object in question. 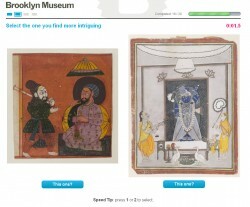 The exhibition was an opportunity to facilitate a collaboration between Brooklyn Museum curators, the Museum's online community using technology and the web to learn more about the visitor experience. The Split Second website hosted the online activity and the project's findings. 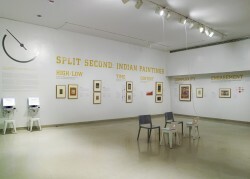 Split Second began with a three-part activity that explored the Museum's collection of Indian paintings; participation was open to anyone with an Internet connection. The first stage explored split-second reactions: in a timed trial, participants were asked to select which painting they preferred from a randomly generated pair of images. Next, participants were asked to write in their own words about a painting before rating its appeal on a scale. In the third phase, participants were asked to rate a work of art after being given unlimited time to view it alongside a typical interpretive text. Each part of the exercise aimed to examine how a different type of information-or a lack there of-might affect a person's reaction to a work of art. The first stage of the online activity explored split-second reactions: in a timed trial, participants were asked to select which painting they prefer from a randomly generated pair of images. In the second stage of the online activity, participants were asked to write in their own words about a painting before rating its appeal on a scale. In the third stage of the online activity, participants were asked to rate a work of art after being given unlimited time to view it alongside a typical interpretive text and label information. Split Second culminated with an installation on the Museum's second floor, which opened July 13, 2011 and ran through December 31, 2011. Visitors were able to view a selection of the paintings that generated the most controversial and dynamic responses during the evaluation process, accompanied by a visualization and analysis of the data collected. In the Split Second exhibition, visitors were able to view a selection of the paintings that generated the most controversial and dynamic responses during the evaluation process, accompanied by a visualization and analysis of the data collected. Using the online activity, 4,617 participants created 176,394 ratings and spent 7 minutes and 32 seconds on average in their session. Participation demographics of those using the activity were analyzed by age, gender, experience level, location, and completion rates. Data from the online activity was analyzed and published on the project's website. Big picture findings from the data analysis were highlighted in the gallery installation along with objects that illustrated each data point. High/Low: Certain paintings consistently inspired very positive and very negative responses, no matter other factors coming into play. Time: People respond differently with limited time. When participants had unlimited time to ponder the works, there was widespread change in their responses. Some paintings saw dramatic gains in their relative ranking, while others saw losses. Context: Adding context leads to more positive responses. Participants were asked to rate paintings with different amounts of contextual information. Some people rated paintings with no information, while others were shown tags, a caption, or a full interpretive label. On average, adding any sort of contextual information raised scores by about 10 points, with some as high as 16 points. Complexity: When shown with no context, complex images do better. Complex paintings-those determined to be rich in information by a computer program-reliably got higher scores, but only when shown without any accompanying text. Engagement: After a group of participants answers a question about a painting, they tend to give the painting similar ratings. When people were given unlimited time to rate an image, their ratings tended to spread across the scale. However, when a group was instructed to answer a question about a work of art such as the one here, their ratings tended to be closer to those of others who did the same task. The question that resulted in the most agreement was: "About how many figures are depicted in this painting?" Within the gallery exhibition, the same online activity was hosted at kiosks within the installation. Data gathered in this setting was compared to that which was gathered online and every major finding of the experiment held true showing that the way our online audience viewed information didn't differ so much from the physical visitor coming through our doors. Split Second: Indian Paintings was organized by Shelley Bernstein, Chief of Technology, Brooklyn Museum, in consultation with Joan Cummins, Lisa and Bernard Selz Curator of Asian Art, Brooklyn Museum. The Museum's web team, Beau Sievers and Paul Beaudoin, developed the interactive web site for the project. Beau Sievers, the Museum's Web Developer, completed the data analysis and published the findings. Jeremiah Boncha, the Museum's Graphic Designer, created the data visualizations used in the gallery installation.